It was inspiring to see the call for a $15 minimum wage take center stage at last week’s presidential debate in New York. And arguably, to become the most contentious part of it, each candidate jockeying to prove their support for what was once considered a politically impractical dream. Our movement has come a long way. But as an early participant in this movement, and as an elected official who centered the Fight for $15 in my 2013 election campaign for Seattle City Council, I was surprised to hear from Hillary Clinton that she had always supported $15. Even more surprising, she specifically said she supported the call for $15 here in Seattle, the first major city to pass it. I can tell you, this came as a news flash to all the activists and fast-food workers who fought hard against Big Business to win $15 in Seattle. At that point, if someone like Hillary Clinton had so much as tweeted in support of $15, it would have made our work a lot easier. But she did nothing of the kind. 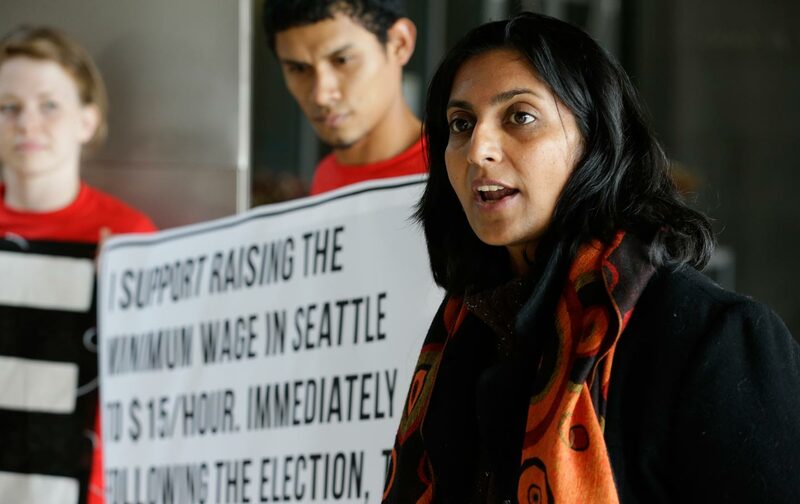 Months later, when our grassroots campaign had succeeded in making $15 the defining issue in that year’s Seattle elections, corporate politicians began to come out of the woodwork, trying to hitch their election campaigns to the issue. By early the next year, every politician was getting on the $15 train, some cynically looking to make careers out of it. And while that wider platform of elected officials was a step toward our movement’s victory, it would be dangerous if the real story of how $15 was won wasn’t told. Our victory in Seattle was not a gift from on high. It was only after working people got organized and forced $15 onto the political agenda that corporate politicians found themselves with no choice but to go along. That is what we are witnessing in Hillary’s sudden support. The $15 train has come to the New York primary, and suddenly Hillary Clinton has jumped on board for a photo op. She has been aided by conservative union leaders who, when the victory for $15 was announced in New York, invited Clinton to speak and take credit! This has outraged thousands of workers and activists. It is also a reminder of the logic of lesser-evilism, which again and again features progressive leaders covering up for the crimes of corrupt politicians. We are, after all, talking about a former six-year board member of Walmart. With a straight face, we have the spectacle of Clinton simultaneously accepting hundreds of thousands of dollars from Walton family billionaires, who workers have had to battle year after year in their fight for $15, turning around and claiming to champion the interests of those low-wage workers. Bernie on the other hand, has made $15 central to his campaign from the beginning. And I believe he means it. He was following the Fight for $15 in Seattle when it was actually happening. A few days after I won my 2013 election, Bernie called me on the phone to congratulate me, recognizing the significance of an elected socialist fighting for $15. But it’s not just $15. The wider package of far-reaching reforms Bernie Sanders has campaigned for is completely unacceptable to the billionaire class, Wall Street, and seemingly the Democratic Party establishment. It is no accident that when Democratic Senator Jeff Merkley came out to endorse Bernie Sanders this week, he was the very first senator to do so. By comparison, 40 senators have come out for Hillary, along with 166 House members. In reality, Clinton is a perfect example of why I’ve consistently argued that the best way to win $15 at the federal level, Medicare for All, and free college education is by building an independent movement and our own independent political party of the 99 percent. History has shown again and again that establishment, business-backed politicians try to stop and derail the train long before they get on board. Again and again, they act as a brake on movements and on winning gains for workers until we are strong enough to overcome their resistance. And finally they try to rewrite a sanitized version of history with themselves in the driver’s seat. Of course, Hillary’s “support” is welcome—it is a sign of our movement’s power. But we also cannot allow Clinton and her ilk to use our movement as a step ladder for their Wall Street–funded careers.